Description: The stunning Cartier pendant pairs a Sahara Taupe Idalight shade with a frame and hardware which are featured in a Mahogany Bronze finish. Custom crafted by highly skilled artisans in our 180,000 square foot manufacturing facility in Yorkville, New York. Custom options include special sizes, styles and finishes, as well as dimmable energy efficient lamping options such as LED. 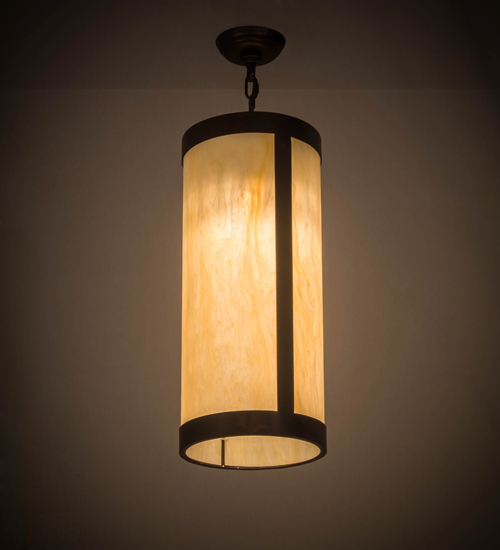 The cylindrical shaped pendant is UL and cUL listed for dry and damp locations.